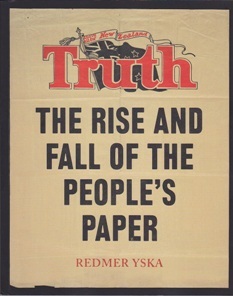 A book I picked up yesterday at Whitcoull's in Brown's Bay is Redmer Yska's new work (published around November last year) on the history of the NZ Truth newspaper. I'm reading it at the moment, and I have to say I'm hooked. Yska's style is easy to follow, and through the story of the country's first tabloid (originating via John Norton, connected with the Truth in Sydney as well as the Bulletin) the reader comes across New Zealand's multi-textured quilt of social history set against scandal, racism, union struggle, political machinations, and more. I didn't know that the entirity of the record of the first year of publication of the NZ Truth is missing. It began in 1905, but all copies of that year are gone, not even held in the National Library (their Papers Past coverage begins in 1906). Yska also talks about the setting up of the United Press Association (later NZPA) in the late 19th century, and the £1000 entrance fee for belonging to the association in 1894 (as Yska says in the book, that's a whopping $170,000 today). Buy it or borrow it -- I thoroughly recommend that you have a read of this example of jourmalism history. As this is linked to Oz publication history I hope the National Library and other libraries/historical societies have taken note and bought copies! I have a memory of John Norton being horse whipped in Pitt Street - yes, he also claimed to have invented the word "wowser", quite a character. Shame that first year is missing , I wonder if there could be any copies this side of the ditch(although I don't doubt the author has thoroughly searched for them). Yska describes Norton as: "... a combustible mix of tycoon, journalist, do-gooder, and chronic, fall-down pisshead." Despite its constant agendas, usually right-wing agendas, Truth was for many years the only newspaper doing what is now called "investigative" journalism. This made its degeneration and demise all the more sad. Norton was only one of many great and larger-than-life characters that passed through its offices over the decades; I'd have loved to be a fly on the wall.